Fans of game consoles from the golden era of TV game appliances have been in for a treat over the past couple of years as a slew of official reboots of the stars of the past have reached the market. These so-called “classic” consoles closely follow the styling of the originals, but under the hood they pack modern hardware running an emulator to play a selection of games from ROM. Even better, with a bit of hacking they can run more than just the supplied emulator, people have managed to use them to emulate completely different consoles. Even then, it’s unexpected to find that a PlayStation emulator on a Super Nintendo Classic runs PlayStation games better than the same emulator built in to Sony’s own PlayStation Classic console. The feat from [8 Bit Flashback] is achieved despite both machines having near-identical hardware specifications based upon the Allwinner R16 system-on-chip. The Nintendo provides smoother action and more responsive controls, making for a far superior gaming experience. How is this achieved? The most significant difference is that the SNES Classic had the RetroArch front end installed upon it, which may have lent some optimisations and tweaks to make the system more efficient. Readers with an eye for unusual consoles may remember another Nintendo/Sony hybrid, the ill-fated early-1990s prototype SNES with a CD-ROM which was the first machine to bear the name “PlayStation” (or “Play Station” as it was sometimes styled, leading Sony marketeers to be hot on writers using a space between the words a few years later). 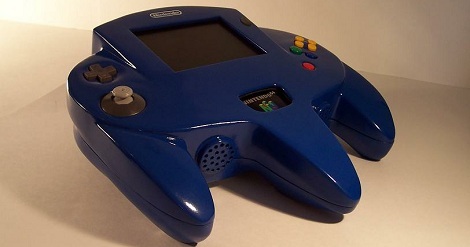 We’ve seen portable N64s before, but none were at the level of [Bungle]’s oversized N64 controller casemod. Instead of the usual ‘sanding Bondo and gluing styrene’ method we’ve seen in other casemods, [Bungle] decided to make a silicone mold with a positive master. Not only did [Bungle] end up with a case indistinguishable from something produced in a factory, but the molding process left him with more internal room and the ability to make identical duplicates of his over sized controller. The electronics are the standard fare – a slightly modified N64 with a PSone LCD screen. Because the rumble and memory packs are built in to the body of the gigantic controller, [Bungle] added a multifunction pak to provide ports for power, brightness controls, a/v, and a second controller. This is an amazing build that really steps up the game for console modders. You can check out [Bungle]’s demo video after the break. [Parker] emailed us today to show off his latest NES portable build. This time he’s using the standard “top loader” NES instead of the typically used NES on a chip. This is pretty cool since the NES on a chip has compatibility issues with some games. For the screen, he uses a common PSone screen with a slight power modification. From the factory, the screen takes 7.4 V and converts it down to 5V to use. He removed this and ran it directly from his own 5V power source. It may not seem like that big of a deal, but with portables, every bit counts. He also ditched the sound amplifier from the PSone screen in favor of something a little more efficient. He seems to have done a pretty good job because he says it gets roughly 10 hours at full volume right now. Another cool aspect of this deign is that the cartridge serves as a sort of stand for the unit, although the button placement looks like it might be a tiny bit awkward when used this way. We really love when friendly competition leads to excellent hacking. 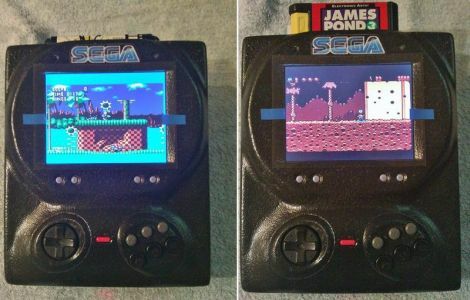 Not too long ago, we showed you a nicely done Sega Genesis portable put together by console hacker [Downing] who challenged fellow hacker [EVIL NOD] to a build off. The two were hacking Sega consoles, [Downing’s] for personal use, while [EVIL NOD] was working on a commissioned build. As you might have guessed, [Downing] finished first, but that doesn’t mean [EVIL NOD’s] console is anything but spectacular. His Sega Multi Gen is a portable Genesis console modified to play both NTSC and PAL games. It features a large 5” PSOne screen as well as the guts from an official 6-button Genesis game pad. The case was vacuum formed by [Downing], and is another example of his fine workmanship. The console looks as if it’s had the controller melted right into its face – a design that is sure to give you the authentic feel of sitting in front of your TV mashing away at the buttons. Check out the video below to see an unboxing video that [EVIL NOD] put together before sending the console out to its new owner. [David] recently wrote us to share the portable Nintendo 64 he constructed with the help of the friendly people over at the ModdedbyBacteria forums. We are no strangers to N64 portables, as you may have noticed, but this one was just too good to pass up. 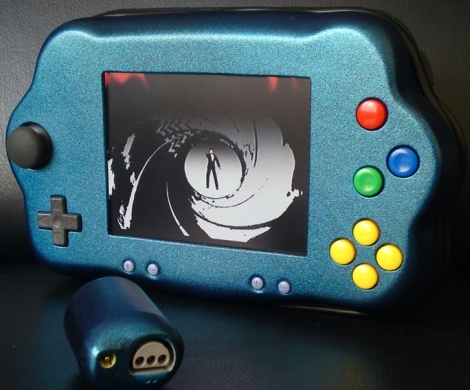 Sheathed in a metallic blue case, this console is an instant standout among the other portable N64 mods we have seen. As you would expect, he trimmed down an N64 console board and some various controller bits in order to fit them into the case, finishing it off with a 5″ PSOne display panel. A small fan protrudes out of the back side of the device, which seemed out of place at first. However, it not only keeps the console cool, but it can serve as a bit of a “kickstand” as well, if the console is placed on a flat surface. [David] also added a dongle for the bottom of the console, which allows him to use an external N64 controller if he so desires. To be honest, one of our favorite features is that the game cartridges do not stick up from the back of the case when inserted. He included just enough room to allow the game to be completely hidden while playing. Nice job! Continue reading to see a video build log and demonstration of his portable N64. Like many people [Kyle] loves the Nintendo 64 and decided he wanted a portable version of his beloved console so he could play games while on the move. One year, two PSOne screens, and three N64 consoles later, his vision is complete. A Game Boy Advance travel case was gutted and used to house the console, hence the “N64 Advance” moniker. 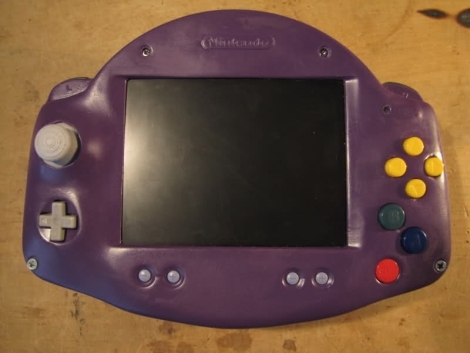 Like many others, his project uses a PSOne screen for the display, and a Li-Poly battery pack that provides up to 3.5 hours of playing time. He made sure to include other members of the Nintendo family in his build by adding a pair DS Lite speakers to the mix. This build also includes some nice “extras” such as having the N64 RAM expansion pack built-in, headphone and A/V out ports (with a screen kill-switch for TV use), and an external controller port that can be used by either the first or second player. Be sure to check out the video of his build after the jump.